floatingsheep: IRONSHEEP 2014: Wow. So Sheep. Such Maps. IRONSHEEP 2014: Wow. So Sheep. Such Maps. 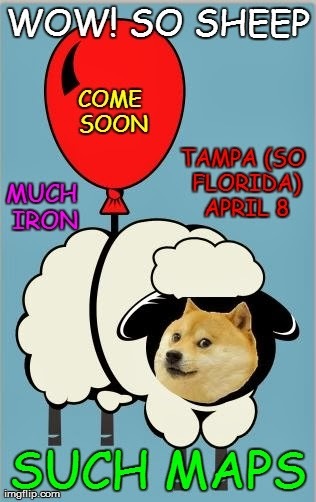 We are happy to announce that we will be holding our third annual IronSheep geo-hackathon at this year's annual AAG conference in Tampa, Florida. The event seeks to mimic the format of the “Iron Chef” television series and challenges participants (grouped into teams with members from diverse backgrounds and skill sets) to produce meaningful analysis and fun, evocative map mash-ups from the same sets of user-generated, geo-coded data within a four hour time frame. The goal is to provide a semi-structured environment where participants can socialize and work on a fun, yet socially meaningful project. Participants will be drawn from academic, industry and artistic communities from around the world. Interested? We have a larger venue (thanks to Tampa Bay Wave) this year than in years past and so encourage all to come. We do ask, however, that you pre-register so we have an idea of attendance. There will be prizes, there will be trophies, there will be gratuitous sheep and use of the doge meme. Don't bring: wolves, Chupacabra or mint sauce as we have learned last year they are hazardous (or offensive) to sheep. We will provide food, beverages, data, internet, prizes and sparkling commentary. And perhaps even present one of the floating sheep collective as a sheep. But don't count on that last point. Can anyone stop Joe from achieving the first ever Iron Sheep hat trick? Will he just draw out maps by hand this year that look nothing like Florida? Will he actually install ArcGIS this year so that he doesn't have to rely on shaky interweb access? Stay tuned, faithful reader. This is so sweet, "there will be gratuitous sheep". This is too: "Bring ewes, rams and lambs". I embedded the Slideshare presentation from the prior IronSheep, I think it was in 2012. I love Floating Sheep.